The death of the world's longest reigning monarch, Thailand's revered King Bhumibol Adulyadej at the age of 88, is a stunning blow for the kingdom of 67 million people, most of whom have known no other sovereign. His son and heir apparent, the country's Crown Prince, has said he wants to mourn the loss of his father before ascending to the throne. The king had been in poor health for a long time, primarily spending his last years in a Bangkok hospital. He died Thursday evening. Bhumibol, also known as Rama IX, came to the throne as an 18-year-old in 1946 after the mysterious shooting death of his 20-year-old brother, King Ananda Mahidol. Thailand's Prime Minister, Prayuth Chan-ocha, announced the heir to the throne has been designated for many years, and the Cabinet will inform parliament of the decision. "Let us wait for the right time," Prayuth told reporters after the king's son and heir apparent, 63-year-old Prince Vajiralongkorn, asked for more time to mourn. Prayuth also said security measures were being boosted throughout the country, with a visibly heavier presence of soldiers. Thitinan Pongsudhirak, a political scientist at Chulalongkorn University, said King Bhumibol’s reign was marked by a long period of development in Thailand. “All living Thais have been under the same reign by His Majesty. A lot of people went through the 1960s, '70s and '80s, seeing the king working so hard for the people, for the country. So the modernization of Thailand was really under this king. 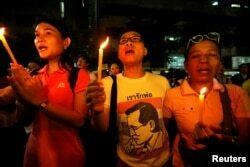 That’s why the people of Thailand are deeply grateful and also very sad by his passing," Thitinan said. Thailand celebrated the 70th anniversary of Bhumibol's accession on June 9, with millions of his subjects donning yellow shirts for the day. U.S. President Barack Obama, in a statement of condolences, called Bhumibol "a tireless champion of his country’s development and demonstrated unflagging devotion to improve the standard of living of the Thai people." Bhumibol Adulyadej was born in Cambridge, Massachusetts, in the United States, a grandson of one of the Kingdom of Siam's most revered monarchs, Chulalongkorn, or Rama V.
Throughout the last half of the 20th century, Rama IX became the most familiar king Thailand had ever known with the advent of mass media portraying him as a wise and compassionate head of state, working effortlessly to improve the lives of his mostly rural subjects. The king was revered as a semi-deity in the deeply Buddhist country. His rule provided a bedrock of stability in a country faced with many social and economic challenges, including a fragile democratic system. The kingdom now is governed by a military junta, which took power in a bloodless coup on May 22, 2014, ousting a weak civilian government beset by sometimes violent street protests. During his reign, there were frequent military coups. Bhumibol acted as the ultimate arbitrator over feuding generals, defusing dangerous situations and sometimes consenting to the army's request for the overthrow of elected governments. A woman weeps after an announcement that Thailand's King Bhumibol Adulyadej has died, at the Siriraj hospital in Bangkok, Thailand, Oct. 13, 2016. Thitinan said the new monarch, Vajiralongkorn, will move to cultivate a moral authority evident by his father’s long reign and adjusting to balance both monarchy and democracy. “We need both to have a monarchy but also to have a workable democracy. Not too much of one at the expense of the other. To do this, we also have to bear in mind that the moral authority is not the same and therefore some adjustment, some accommodation will have to be made. Otherwise, we will see some tension,” he said. Thailand's Crown Prince Vajiralongkorn addresses the audience at the royal plowing ceremony in Bangkok, Thailand, May 9, 2016. When the time comes to ascend to the throne, Prince Vajiralongkorn will also inherit properties said to be worth in excess of $35 billion. The prince has never achieved the esteem enjoyed by the king and Queen Sirikit, who has also been in poor health for years. The prince remains a rather remote figure, especially compared with his popular younger sister, Princess Sirindhorn, known for her charitable work and humility. 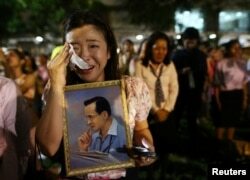 Some Thais have quietly spoken of having the princess succeed her father. But she has not been designated a possible heir and most Thai political analysts say the powerful military backs the crown prince. 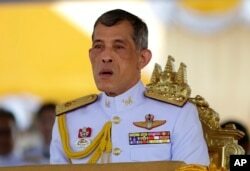 The succession can not be openly discussed in Thailand, which has harsh lese majeste laws. Any perceived criticism of the monarchy or its top royals can result in quick arrest and long prison terms. People mourn after an announcement that Thailand's King Bhumibol Adulyadej has died, at the Siriraj hospital in Bangkok, Thailand Oct. 13, 2016. The death of the monarch, who was always the critical political institution in the kingdom, creates "a shift in the Thai political landscape," says associate professor Pavin Chachavalpongpun of Kyoto University's Center for Southeast Asian Studies. "Whether it's smooth or violent remains to be seen. From now on, we might see a more prominent role of the military." Analysts say the yearlong period of official mourning will put on hold any quick return to civilian government, indefinitely extending the military's rule.